Tilapia ( ) is the common name for nearly a hundred species of cichlid fish from the tilapiine cichlid tribe. Tilapia are mainly freshwater fish inhabiting shallow streams, ponds, rivers and lakes and less commonly found living in brackish water. Historically, they have been of major importance in artisan fishing in Africa and the Levant and are of increasing importance in aquaculture and aquaponics. Tilapia can become problematic invasive species in new warm-water habitats such as Australia, whether deliberately or accidentally introduced, but generally not in temperate climates due to their inability to survive in waters cooler than about 21 °C (70 °F). 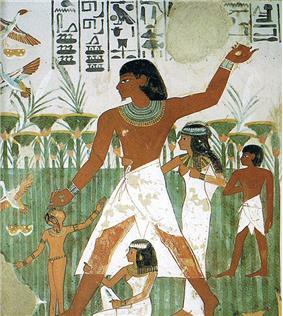 The Tomb of Nakht, 1500 BC, contains a tilapia hieroglyph just above the head of the central figure. Tilapia were one of the three main types of fish caught in Biblical times from the Sea of Galilee. At that time they were called musht, or commonly now even "St. Peter's fish". The name "St. Peter's fish" comes from the story in the Gospel of Matthew about the apostle Peter catching a fish that carried a coin in its mouth, though the passage does not name the fish. While the name also applies to Zeus faber, a marine fish not found in the area, a few tilapia species (Sarotherodon galilaeus galilaeus and others) are found in the Sea of Galilee, where the author of the Gospel of Matthew recounts the event took place. These species have been the target of small-scale artisanal fisheries in the area for thousands of years. 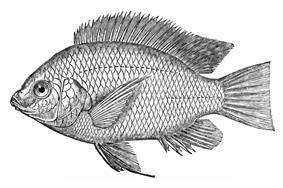 The common name tilapia is based on the name of the cichlid genus Tilapia, which is itself a latinisation of thiape, the Tswana word for "fish". Scottish zoologist Andrew Smith named the genus in 1840. Tilapia typically have laterally compressed, deep bodies. Like other cichlids, their lower pharyngeal bones are fused into a single tooth-bearing structure. A complex set of muscles allows the upper and lower pharyngeal bones to be used as a second set of jaws for processing food (cf. morays), allowing a division of labor between the "true jaws" (mandibles) and the "pharyngeal jaws". This means they are efficient feeders that can capture and process a wide variety of food items. Their mouths are protrusible, usually bordered with wide and often swollen lips. The jaws have conical teeth. Typically tilapia have a long dorsal fin, and a lateral line which often breaks towards the end of the dorsal fin, and starts again two or three rows of scales below. Tilapia as a common name has been applied to various cichlids from three distinct genera: Oreochromis, Sarotherodon and Tilapia. The members of the other two genera used to belong to the genus Tilapia but have since been split off into their own genera. However, particular species within are still commonly called "tilapia" regardless of the change in their actual taxonomic nomenclature. Tilapia has been used as biological controls for certain aquatic plant problems. It has a preference for a floating aquatic plant, duckweed (Lemna sp.) but also consume some filamentous algae. In Kenya tilapia were introduced to control mosquitoes which were causing malaria, because they consume mosquito larvae, consequently reducing the numbers of adult female mosquitoes, the vector of the disease (Petr 2000). 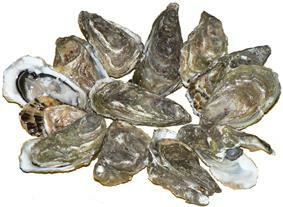 These benefits are, however, frequently outweighed by the negative aspects of tilapia as an invasive species. Tilapia are unable to survive in temperate climates because they require warm water. The pure strain of the blue tilapia, Oreochromis aureus, has the greatest cold tolerance and dies at 45 °F (7 °C), while all other species of tilapia will die at a range of 52 to 62 °F (11 to 17 °C). 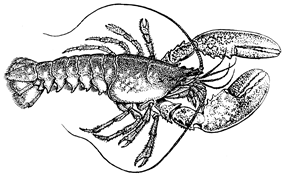 As a result, they cannot invade temperate habitats and disrupt native ecologies in temperate zones; however, they have spread widely beyond their points of introduction in many fresh and brackish tropical and subtropical habitats, often disrupting native species significantly. 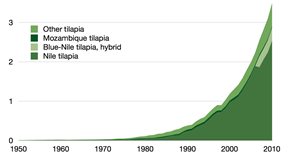 Because of this, tilapia are on the IUCN's 100 of the World's Worst Alien Invasive Species list. In the United States, tilapia are found in much of the south, especially Florida, Texas, as well as far North as Idaho where they survive in power plant discharge zones. Tilapia are also currently stocked in the Phoenix, Arizona canal system as an algae growth control measure. Many state fish and wildlife agencies in the United States, Australia, South Africa, and elsewhere consider them to be invasive species. Larger tilapia species are generally poor community aquarium fish because they eat plants, dig up the bottom, and fight with other fish. However, the larger species are often raised in aquariums as a food source, because they grow rapidly and tolerate high stocking densities and poor water quality. 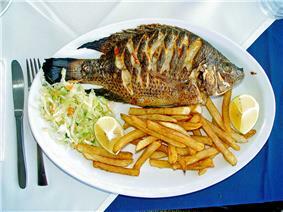 Smaller West African species, such as Tilapia joka and species from the crater lakes of Cameroon, are more popular. In specialised cichlid aquaria, tilapia can be mixed successfully with nonterritorial cichlids, armored catfish, tinfoil barbs, garpike and other robust and dangerous fish. Some species, including Tilapia buttikoferi, Tilapia rendalli,Tilapia mariae, Tilapia joka and the brackish-water Sarotherodon melanotheron melanotheron, have attractive patterns and are quite decorative. The tilapiines of North Africa are the most important commercial cichlids. 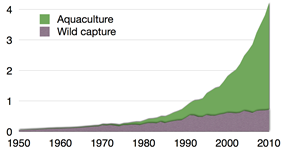 Fast-growing, tolerant of stocking density, and adaptable, they have been introduced to and are farmed extensively in many parts of Asia and are increasingly common aquaculture targets elsewhere. Unlike carnivorous fish, tilapia can feed on algae or any plant-based food. This reduces the cost of tilapia farming, reduces fishing pressure on prey species, avoids concentrating toxins that accumulate at higher levels of the food chain and makes tilapia the preferred "aquatic chickens" of the trade. At 1.3 million tonnes per annum, China is the largest tilapia producer in the world, followed by Egypt with 0.5 million. 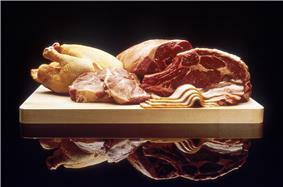 The US, by comparison, produces 10 thousand tonnes against a consumption of 2.5 million. 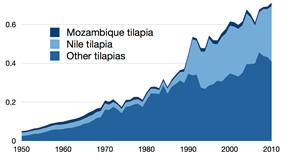 In modern aquaculture, wild-type Nile tilapia are not too often seen, as the dark color of their flesh is not much desired by many customers, and because it has a bit of a reputation of being a trash fish associated with poverty. On the other hand, they are fast-growing and give good fillets; leucistic ("Red") breeds which have lighter meat have been developed and these are very popular. Hybrid stock is also used in aquaculture; Nile × blue tilapia hybrids are usually rather dark, but a light-colored hybrid breed known as "Rocky Mountain White" tilapia is often grown due to its very light flesh and tolerance of low temperatures. Tilapia is one of several commercially important aquaculture species (including cyanobacteria that are often present or bloom sporadically in water bodies and soil. 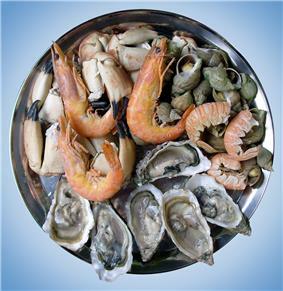 These flavours are no indication of freshness or safety of the fish, but can harm the reputation of a product in the eyes of the consumer. Simple quality control procedures are known to be effective in ensuring the quality of fish entering the market. More recent studies have called into question the value of omega-3 fatty acids relative to omega-6 fatty acids; several randomized controlled trials failed to show that omega-6 fatty acids caused an increase in heart disease, while a study involving 70,000 patients in Greece found administering omega-3 supplements provided no health benefits. Tilapia serve as a natural, biological control for most aquatic plant problems. Tilapia consume floating aquatic plants, such as duckweed watermeal (Lemna sp. ), most "undesirable" submerged plants, and most forms of algae. In the United States and countries such as Thailand, they are becoming the plant control method of choice, reducing or eliminating the use of toxic chemicals and heavy metal-based algaecides. Tilapia rarely compete with other "pond" fish for food. Instead, because they consume plants and nutrients unused by other fish species and substantially reduce oxygen-depleting detritus; adding tilapia often increases the population, size and health of other fish. They are used for zoo ponds as a source of food for birds. For example, tilapia can be farmed together with shrimps in a symbiotic manner positively enhancing the productive output of both. “The salinity level of the Salton Sea is about 45 parts per thousand (ppt), which is about 30 percent saltier than the ocean"
^ Froese, Rainer and Pauly, Daniel, eds. (2012). "Oreochromis niloticus in FishBase. September 2012 version. ^ Froese, Rainer and Pauly, Daniel, eds. (2012). 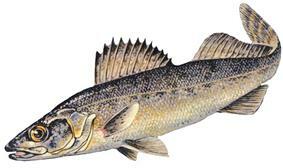 "Oreochromis aureus in FishBase. September 2012 version. ^ Froese, Rainer and Pauly, Daniel, eds. (2012). "Oreochromis mossambicus in FishBase. September 2012 version.